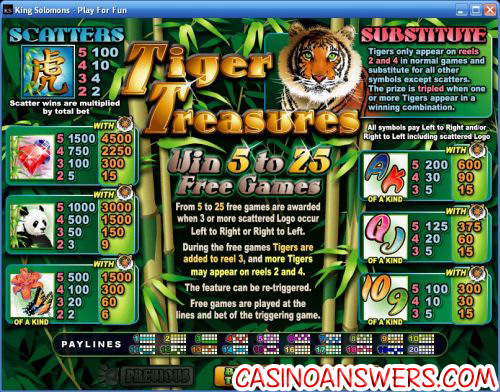 Tiger Treasures Video Slot Guide & Review - Casino Answers! Tiger Treasures is a 5-reel, 20-line video slot developed by Realtime Gaming, featuring scatter wins, a wild symbol, multipliers, free spins and a progressive jackpot. You can play the Tiger Treasures video slot game at US-friendly online casinos Aladdin’s Gold Casino and Rushmore Casino. To get started on the Tiger Treasures slot machine, use the up and down paws next to “Bet” to set your bet at $0.01, $0.02, $0.03, $0.04, $0.05, $0.06, $0.07, $0.08, $0.09, $0.10, $0.25, $0.50, $1, $2.50, $5, $10 or $25 per line. You can also set the number of active paylines use the paws next to “Lines.” The lowest total bet you can make on the Tiger Treasures slot is $0.01. The highest total bet you can make is $500 per spin. Obviously, with this type of betting range, both low and high stakes players will be happy playing Tiger Treasures. To spin the reels, hit the “Spin” button. The Tiger symbol will only appear on the second and fourth reels during the regular slot game. It is the wild symbol, thus it substitutes for all symbols in Tiger Treasures except for the Logo scatter symbol. The Tiger symbol will act as a 3X multiplier on winning combinations, meaning it can triple your winnings! The top fixed jackpot on the Tiger Treasures video slot is 4500X your bet per line. To win the 4500 coin top fixed jackpot, you must couple the Tiger symbol with either the Ruby or the Sapphire symbols to complete a winning combination. Without the Tiger symbol, the two stones will pay out up to 1500X your bet per line. You can win from 5 to 25 free spins when 3 or more Scattered Logo symbols appear from left to right or right to left. During the free spins feature, the Tiger symbol will be added to reel 3, with more Tigers added to reels 2 and 4. The free spins feature can be re-triggered. Free spins are played at the lines and bet of the triggering spin. The Tiger Treasures free spins feature is one of the many ways you can open the treasure box and win big playing Tiger Treasure at Aladdin’s Gold Casino. Hit “Autoplay” to access Tiger Treasures’ autoplay mode. 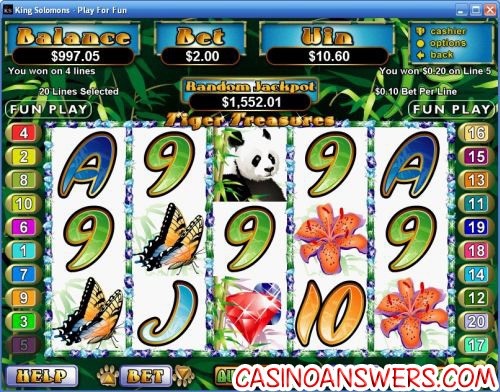 Using autoplay, you can set the number of spins (up to 1000), stop autoplay when the jackpot is won, stop if a win exceeds or equals (up to $99,999.99), stop on any win, stop if your balance increases by (up to $99,999.99), stop if your balance decreases by (up to $99,999.99) or stop once free spins feature is triggered. You can stop the autoplay mode on the Tiger Treasures video slot at any time using the “Stop Auto” button. There are even more features on the Tiger Treasures. In the middle of any spin, you can hit the “Stop” button to use skill stop to halt the reels. You can also find the Turbo Play mode in the game options to speed up the gameplay. Tiger Treasures features a randomly triggered progressive jackpot. It can be on at the conclusion of any spin you make on the game. Progressive Jackpot wins are added to other slot game wins. Random Jackpot contribution is no more than 1.5% total Return to Player. Both tigers and pandas are among the world’s favourite non-domesticated animals. Perhaps it is due to their endangered status, but maybe some animals simply have an endearing quality that Tiger Treasures is able to capture with its amazing art and roaring sound effects. Get a 200% unlimited bonus to play the Tiger Treasures video slot at Aladdin’s Gold Casino! Are American players able to play the Tiger Treasures video slot for real money? Absolutely! You can play the Tiger Treasures slot machine even if you are located in the United States at select RTG online casinos, such as Aladdin’s Gold Casino and Rushmore Casino. Are there any RTG casinos that only accept non-USA players? Yes, if you are outside the United States and would rather play at another casino, you can also play the Tiger Treasure slot game at the RTG version of King Solomons Casino, which frequently gets rave reviews from our Australian friends. Where can I play a Flash game of Tiger Treasures for free? If you do not wish to download the casino software (or if you are a Macintosh user), you can use Instant Play Flash casinos to play Tiger Treasures, such as Aladdin’s Gold Flash Casino and Rushmore Flash Casino. You can play for free or real money using Flash. If you have any difficulties with the Flash casino, make sure you have the most up-to-date version of Adobe Flash Player installed on your computer. Is Tiger Treasures a Progressive Jackpot Slot? How can I win it? Yes, Tiger Treasures does have a progressive jackpot. It is a random jackpot, which means that any spin you make on the Tiger Treasure progressive jackpot slot can win! You don’t even need a winning combination. Are there any animal based slot machines? Are there any wild animal themed slots?